In “The House That Was Never Built,” an excerpt from “Recruits for World Conquests,” Charles T. Ball recounts the calling of a fiery cowboy turned Baptist preacher, Lee Rutland Scarborough. Growing up on a West Texas ranch, Scarborough quickly honed his skills at horseback riding, roping, and handling a six-shooter. The tenacity and strong work ethic he learned on the open range marked his ministry as a pastor and as the second president of Southwestern Baptist Theological Seminary (from 1914-1942). Scarborough, whose heart burned for evangelism, published “Recruits for World Conquests” in 1914, imploring men and women to surrender themselves to follow God’s call to ministry. 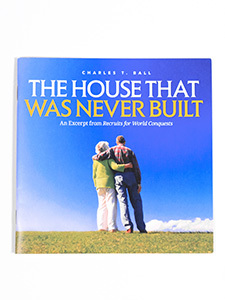 As the final chapter of this book, “The House That Was Never Built” underscores Scarborough’s appeal. Charles T. Ball (1866-1942) served as professor of missions and comparative religions at Southwestern Baptist Theological Seminary from 1911-1919. He subsequently served as president of Eastern Baptist Theological Seminary in Philadelphia, Pennsylvania, and then founder and president of Eastern University (also in Philadelphia) and the University of Arlington in Arlington, Virginia.